Today, we’re excited to announce the launch of several key enhancements to the data model we use to calculate the risk in portfolios, the user interface for controlling that data model, and several new one-click stress tests you can run on your portfolios. First, we added several enhancements to the data model. We now detect bond holdings, and we correlate those interest rate-dependent investments to the 10 Year US Treasury Rate. No need to turn on the interest rate stress test to see the analysis in that light any more. And we also detect tactically managed funds and have improved how we assess their risk. Second, we rolled out a brand new interface to control the data model assumptions in your portfolio. By the way, notice that you can actually see what the Risk Number for the portfolio would be, without having to select that scenario and let the portfolio recalc! We know that’s a big time saver for some of you who love stress testing. 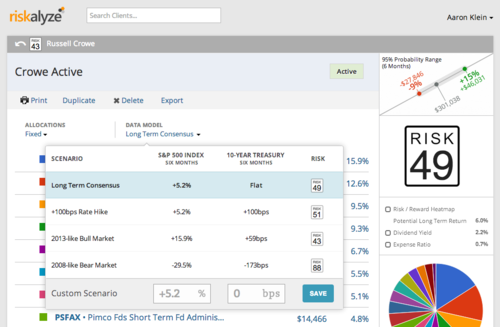 Third, we’ve added several one-click stress tests you can run on your portfolios. The +100bps rate hike keeps the status quo for the market, but raises interest rates by 1%. The 2013-like and 2008-like scenarios apply the S&P and interest rate changes for those quite-opposite market years. Remember — if you want to see how these assumptions calculate into any individual investment, simply click the arrows beside each one to pop open and see the best case / worst case, or return / volatility calculations for that individual fund or stock. We hope you enjoy how simple it is to understand and control the underlying assumptions in your portfolio risk calculations. These changes are now live for all Riskalyze customers.